"Ever since he was at school, actor and comedian Alan Davies has hated maths. And like many people, he is not much good at it either. But Alan has always had a sneaking suspicion that he was missing out. So, with the help of top mathematician Professor Marcus du Sautoy, Alan is going to embark on a maths odyssey. Together they visit the fourth dimension, cross the universe and explore the concept of infinity. Along the way, Alan does battle with some of the toughest maths questions of our age. But did his abilities peak 25 years ago when he got his grade C O-Level? Or will Alan be able to master the most complex maths concept there is?" In this BBC Horizon that I made with Alan Davies we started out taking as our model the Oz Clarke/James May programmes but instead of wine we did maths. I got to play the posh Oz Clarke character: "what a wonderful bouquet this equation has" while Alan could play the urbane James May of maths. But actually the thing soon evolved into a completely different journey. It waas a mathematical road-trip. From Weymouth to Brighton, from Teddington to...well, actually it was more a road-trip of the mind. From primes to probability, quantum chaos to hyperspace. Alan is a clever guy. The village idiot role he plays on QI is just good acting. The director of our Horizon kept on saying: "Alan. Could you pretend you didn't understand the Riemann Hypothesis so quickly". Amazing what a national icon Alan is. Everywhere we went, people would flock to get his autograph. He was mugged by old grannies in Weymouth saying how much they loved Jonathan Creek to teenagers on Brighton Pier who knew him as the Dad in Angus, Thongs and Perfect Snogging. I kept thinking as I stood on my own on the sidelines: "but don't they know I've got a Theorem named after me." The programme was broadcast on BBC2 at 9pm on the 31st of March 2009. It got 2.3 million viewers. Reviews were mixed but then reviewers love knocking Horizon. One really nice review was in the Sunday Times. You can see some clips of the programme on the BBC website. The maths of the beautiful game "During his journey to understand the often vilified science of maths, comedian and Arsenal fan Alan Davies hears that footballers are "mathematical geniuses" and learns how maths can help fans of the game." 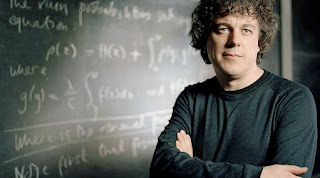 Why maths lacks common sense "Comedian Alan Davies - who has hated maths since school - has embarked on a maths odyssey with the help of mathematician Marcus du Sautoy. In a game of probability, he was challenged to put common sense aside in order to see the power of logical thinking." Here is an explanation of the infamous Monty Hall Game Show.